A new Twitter version designed especially for tablets has been revealed at this year’s IFA event in Berlin. However an official release hasn’t occurred yet, but a leaked version is available for download. The new Twitter app works very well with tablets such as the Nexus 7, Galaxy Note 8.0, Galaxy Tab 3 and so on. 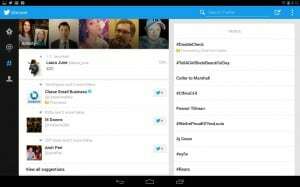 Copy Twitter v4.1.1 apk on your sd card. Go to Settings>Security and tick ‘Unknown Sources’. This allows you to install apk files outside Google Play. Use a file explorer to open the file and install the latest version of Twitter.